With the onset of the Global Crisis, the longstanding downward trend in tariffs and other barriers to trade has come to a halt (Hoekman 2015, Aslam et al. 2016). In its place has come a growing recognition that trade policies create both winners and losers (e.g. Autor et al. 2016). As a result, international trade has become a salient issue in voters’ minds, and some parties and politicians profess strong views on the benefits and costs of particular trade policies. Recent political events such as the election of the Trump administration in the US and the British vote to leave the EU point to an acute danger of rising protectionism. However, today’s world economy is highly interconnected, with complex supply chains that cross over country borders. In this environment, who gains and who loses from particular trade policies is far from transparent. It is even less well understood whether the distributional consequences of proposed protectionist policies line up with the political support for them. In a new paper (Auer et al. 2018), we investigate the connection between the distributional effects of trade policies and voting patterns, using the North American Free Trade Agreement (NAFTA) as a case study. We combine the multi-sector, multi-country, multi-factor general equilibrium Ricardian trade model (e.g. Eaton and Kortum 2002, Caliendo and Parro 2015, Levchenko and Zhang 2016) with a specific-factors model that generates distributional effects of trade across sectors (Jones 1971, Mussa 1974, Levchenko and Zhang 2013, Galle et al. 2017). We calibrate the model to the global matrix of intermediate and final goods trade from the 2016 edition of the World Input-Output Database (WIOD) and WIOD’s Socioeconomic Accounts (Timmer et al. 2015). We simulate a scenario in which NAFTA is dismantled. In particular, this counterfactual entails a rise in tariffs from the current NAFTA-negotiated ones to the ‘most-favoured nation’ (MFN) level, as well as an increase in non-tariff barriers in both goods and service sectors estimated by Felbermayr et al. (2017). The total welfare change from revoking NAFTA would be -0.22% for the US, -1.8% for Mexico, and -2.2% for Canada. These aggregate numbers are an order of magnitude smaller than the distributional effects across sectors. Sectoral real wage changes range from -2.7% to 2.26% for the US, from -16.76% to 9.46% for Mexico, and from -13.90% to 1.74% for Canada. We then analyse the political dimension of this policy by correlating the economic outcomes with recent voting patterns. We first compute the economic impact of this policy at the level of US congressional districts. To do so, we combine the sector-specific real wage changes resulting from our general equilibrium model with information on sectoral employment shares at the congressional district level. Because sectoral employment is unevenly distributed across geographic locations, there would be distributional consequences across space as well. Figure 1 summarises the geography of the economic impact across US Congressional Districts. Average wage changes range from -0.41% in Ohio's 4th district to 0.08% in Texas' 11th district, with a cross-district standard deviation of 0.04%. 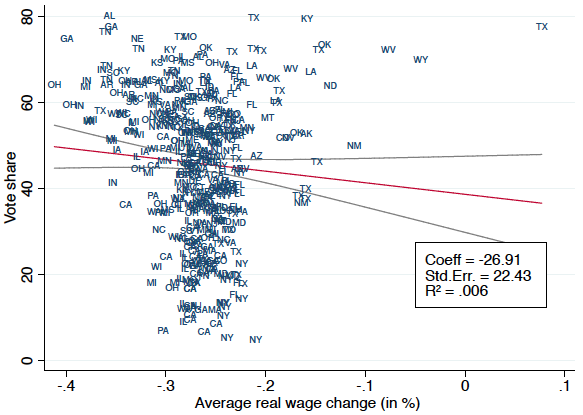 Turning to the relationship with political outcomes, we find that, if anything, there is a negative correlation between the real wage change in a congressional district and the 2016 Trump vote share. Though dismantling or renegotiating NAFTA was a prominent pillar of the Trump presidential campaign, Trump-voting districts would experience systematically greater wage decreases if NAFTA disappeared. Figure 2 presents the scatterplot of the real wage changes due to revocation of NAFTA against the Trump vote share. The slope of the relationship is negative, though not significant, in our baseline scenario. Looking closer, in the baseline the negative relationship is substantially attenuated by districts with a heavy presence of mining and quarrying, such as Texas 11th district (encompassing central Texas and eastern Texas cities of Midland and Odessa), the state of Wyoming (a single Congressional district), and West Virginia 3rd (roughly the southern half of the state). Since mining and quarrying experience a large increase in NTBs in our baseline scenario, these districts are relatively better off from the policy change and voted heavily for Trump. Dropping just 2 districts (out of 435) with the highest mining and quarrying employment shares renders the negative bilateral relationship significant at the 1% level. All in all, with the possible exception of heavily mining areas, Trump-voting congressional districts experience systematically larger wage decreases if NAFTA is revoked. To better understand this somewhat surprising pattern, we construct two simple, heuristic measures of trade exposure to NAFTA at the US congressional district level. The first is a measure of import exposure to the NAFTA partner countries, defined as the employment share-weighted average of sectoral imports from NAFTA partners in total US absorption. Intuitively, import exposure to NAFTA partners is high in a congressional district if it has high employment shares in sectors with greater import competition from those countries. All else equal, we should expect wages to rise the most in locations that in the current regime compete most closely with Canada and Mexico. The second is an export orientation measure, which is the employment share-weighted average of sectoral exports to NAFTA partners in total US output. Intuitively, we should expect locations with higher employment shares in NAFTA-export-oriented industries to lose disproportionately from NAFTA revocation. Taken individually, the bilateral relationships between both heuristics and model-implied wage changes from NAFTA revocation are negative and statistically significant. This is intuitive for export orientation but counterintuitive for import exposure, as it implies that congressional districts currently suffering the most from direct import competition actually see larger real wage reductions when protection increases following a dismantling of NAFTA. At the same time, the statistical association between both of these heuristics and the Trump vote share is positive and significant. This is intuitive for the import exposure measure – locations suffering the most from import competition voted more for Trump – but not for export orientation, as locations exporting to NAFTA should foresee wage decreases if NAFTA is done away with. The apparent mystery is resolved by the fact that the correlation between the two heuristics is extremely high. The export orientation has a 0.92 correlation with import exposure. Thus, the picture that emerges from this exercise is first and foremost one of differences across locations in the overall level of integration with NAFTA countries. Places that suffer the most from NAFTA import competition are also overwhelmingly those that export to NAFTA. It is thus not surprising that the locations overall more open to NAFTA trade experience larger net welfare losses – effectively, a revocation of NAFTA represents a relatively greater reduction in trade openness for those locations. We do show, however, that these locations are also the ones that systematically voted more for Trump. This exercise underscores the difficulty of making simple heuristic judgements about who gains and losses from trade policy changes in the current global economy. The measures of import competition similar to those used in other contexts (e.g. Autor et al. 2013, and the large literature that followed) would be misleading as to which locations would stand to lose the most from NAFTA revocation, and how the distributional effects of NAFTA correlate with the Trump vote. Reaching reliable conclusions requires a model-based quantitative assessment that takes into account multiple import and export linkages and general equilibrium adjustments. Aslam, A, E Boz, E Cerutti, M P Ribeiro, and P Topalova (2016), “Global Trade: What’s Behind the Slowdown?”, IMF World Economic Outlook, Chapter II. Auer, R, B Bonadio, and A Levchenko (2018), “The Economics and Politics of Revoking NAFTA”, NBER Working Paper 25379. Autor, D H, D Dorn, and G H Hanson (2013), “The China Syndrome: Local Labor Market Effects of Import Competition in the United States”, American Economic Review, 103 (6), 2121–68. Autor, D H, D Dorn, and G H Hanson (2016), “The China Shock: Learning from Labor-Market Adjustment to Large Changes in Trade”, Annual Review of Economics, 8 (1), 205-240. Caliendo, L, and F Parro (2015), “Estimates of the Trade and Welfare Effects of NAFTA”, Review of Economic Studies, 82 (1), 1-44. Eaton, J, and S S Kortum (2002), “Technology, Geography, and Trade”, Econometrica, 70 (5), 1741-1779. Felbermayr, G, M Steininger, E Yalcin (2017), “Global Impact of a Protectionist US Trade Policy”, ifo Forschungsberichte. Galle, S, A Rodríguez-Clare, and M Yi (2017), “Slicing the Pie: Quantifying the Aggregate and Distributional Effects of Trade”, NBER Working Paper 23737. Hoekman, B (2015), The Global Trade Slowdown: A New Normal?, VoxEU eBook, London. Jones, R (1971), “A Three-Factor Model in Theory, Trade, and History,” in J Bhagwati (ed. ), Trade, Balance of Payments, and Growth: Papers in International Economics in Honor of Charles P Kindleberger, Amsterdam: North Holland. Levchenko, A A, and J Zhang (2013), “The Global Labor Market Impact of Emerging Giants: a Quantitative Assessment”, IMF Economic Review, 61 (3), 479–519. Levchenko, A A, and J Zhang (2016), “The Evolution of Comparative Advantage: Measurement and Welfare Implications”, Journal of Monetary Economics, 78, 96–111. Mussa, M (1974), “Tariffs and the Distribution of Income: The Importance of Factor Specificity, Substitutability, an Intensity in the Short and Long Run”, Journal of Political Economy, 82, 1191–1203. Timmer, M P, E Dietzenbacher, B Los, R Stehrer, and G J de Vries (2015), “An Illustrated User Guide to the World Input–Output Database: the Case of Global Automotive Production”, Review of International Economics, 23 (3), 575–605.